Of gas-shells dropping softly behind." Ninety years ago at the eleventh hour of the eleventh day of the eleventh month the great guns fell silent and Europe experienced a silence it had not known in years. It was the end of the "Great War," the War to end all Wars. Today, we know that was a hopeful but futile sentiment as the War to end all Wars is now known as World War I. Two bullets and a lost driver set off a powder keg whose explosion engulfed Europe. In the summer of 1914, a driver made a wrong turn and ended up in the path of a young assassin who had actually given up and was just finishing off a sandwich. The young assassin was a Serbian belonging to a radical group known as the Black Hand. Their target was the Arch-Duke Ferdinand of the Austro-Hungarian Empire who was touring Sarajevo. They had tried earlier that day to assassinate him but failed. Now Fate through the hands of a lost driver delivered the Arch-Duke into one of the assassin's hands who took full advantage of his good luck and fired his pistol killing Ferdinand. The assassination caused the collapse of the house of cards that were the national alliances of the day. Austria-Hungary with German support declared war on Serbia. Russia was allied with Serbia so they entered the war. France was allied with Russia and so they entered the war. Germany in order to swiftly attack France violated Belgium's borders by crossing it with their troops. Britain had an alliance with Belgium and so they entered the war. Eventually other nations would enter the war as well including the US. 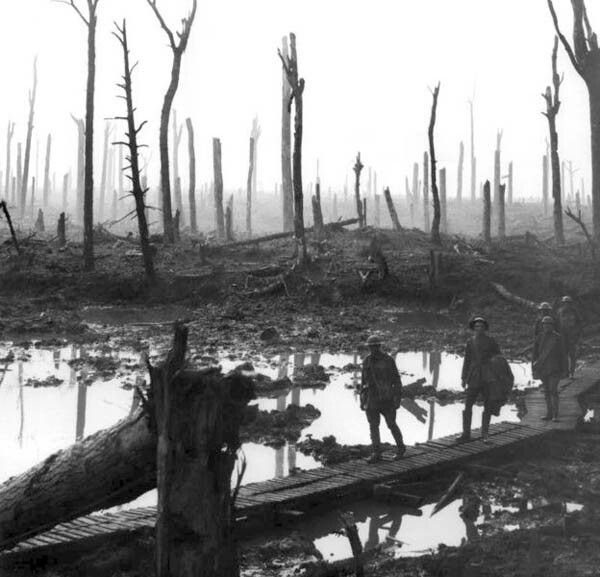 World War I in many ways was the "War to end all Wars" in that it was every war past and future rolled up into one. There were Napoleonic charges, aerial bombardment, a few misguided cavalry charges with actual horses, tanks, machine guns, artillery barrages, air combat, poison gas attacks, flamethrowers, submarine warfare, and primitive hand-to-hand fighting that came down to knives, sharpened spades, and clubs. While fighting took place in Africa, the Middle East, the Balkans, Russia, and the borders of Italy and Austria, the bulk of the fighting took place in the area known as the Western Front. 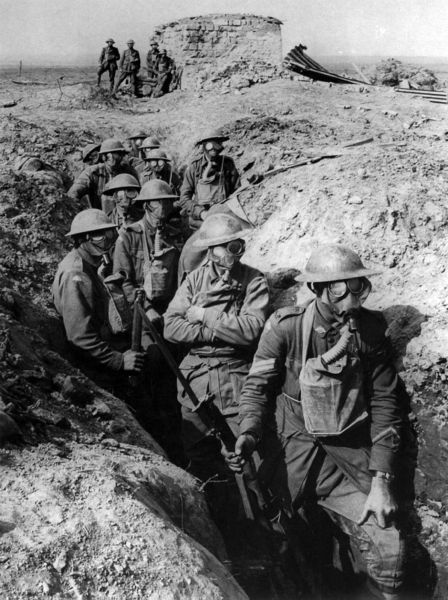 The Western Front was a long series of extensive trenches where most of the intensive fighting of the war took place. So many men died in such a concentrated place. While WWII had a far higher casualty rate, this was widespread throughout the globe. The majority of WWI casualties, however, occurred along the several hundred kilometers of the Western Front from the North Sea to the Swiss border. On the first day of the Battle of the Somme in 1916, the British lost over 50,000 in dead and wounded in the space of a few kilometers. 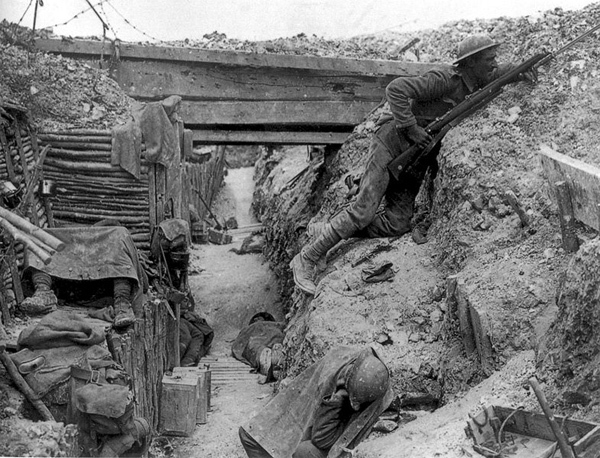 The trenches were hell on earth - mud, water, snipers, artillery barrages, barbed wire, machine gun fire, and the rotting corpses of those who fell in No-Man's Land, the deadly area between the opposing armies' trenches. Plus there was rampant disease, lice, and rats grown fat from feeding off of corpses. No one spoke of him again." The Second World War often gets more attention in the popular imagination. Countless movies, books, comic books, documentaries, TV shows, magazines and so on focus on the many aspects of the war. Battles, generals, strategies, policies, ideologies get constantly battered about from academic circles to office water coolers. 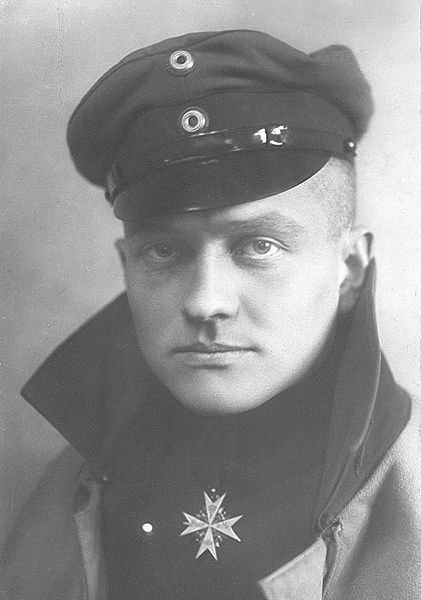 It's a subject many have some knowledge of whereas World War I only brings to mind to some (particularly Americans) the Red Baron, the imaginary nemesis of the Peanut's comic strip character, Snoopy. And there's a good reason for that. With World War II there was a clear reason to fight. For the Allies, it was to defeat the conquering Nazis and Imperialist Japanese. For the Germans, it was to revenge their humiliation with the Treaty of Versailles at the end of the First World War. For the Japanese, it was believed they were saving Asia (though they didn't bother to ask the rest of Asia). It is easier for modern day audiences to understand the rationales and motivations of those who fought in that war. The reasons for fighting the First World War, however, are rather vague. The motivations for the soldiers fighting are also vague. It's hard to understand the patriotic fever which led to so many men signing up to fight a war that appeared to have been fought for the sheer hell of it and no other reason. In modern academia, the "isms" of nationalism, militarism, imperialism are blamed for causing the war. For war enthusiasts, World War I is a hard one to get enthusiastic about. Most of the literature and films on the subject have been anti-war save for a few on WWI pilots and Sergeant York released when America was entering WWII. Then there's strategy. With WWII battles there was often a lot of planning and logistics that went into major battles on both sides. Armchair military historians can easily while away the hours discussing the many stratagems of WWII generals. The battles of WWI on the other hand appear to have been planned by generals who were either appallingly stupid or monstrously callous to causalities that their battles produced. 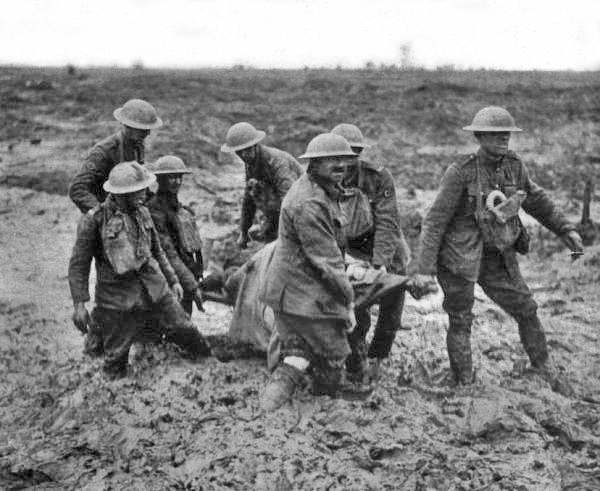 At the Battle of the Somme, soldiers were ordered to advance at a walking pace. This was to keep the lines orderly and lower the chances of friendly fire - it also made the British soldiers perfect targets for German machine gunners. The whole war in retrospect seems a comic-tragedy of epic proportions. Men died in the thousands for a few yards of earth. The British comedy series Black Adder brilliantly showed the insanity of WWI strategy in its fourth season - "Black Adder Goes Forth." In one episode, a general is looking at a scale map of the last battle and asks his aide for the scale. His aid answers "one to one, sir!" and the general shows no surprise but is glad that 17 square feet of mud is no longer in German hands. The Great War ended 90 years ago but the consequences still live with us to this day. The war changed the maps, changed class systems, changed the way wars are fought, and changed technology. Iraq is one of those changes having been created out of the territory of the old Ottoman Empire. Ultimately, Nov. 11 is a bittersweet day to remember the end of a terrible war and all those who died in it. Nov. 11 is also a day to reflect on the futile hope of the time that there would be no other wars to follow. The best of the pilots became celebrities and were and dined by the rich and famous. 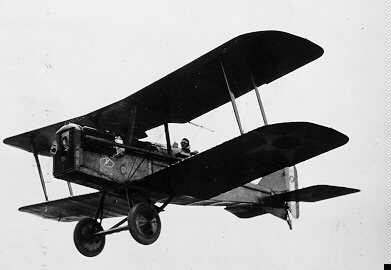 Canadian Fighter Ace William "Billy" Bishop had an audience with Britain's monarch even. But fame could not ward off the spectre of death and even the best went down in flames. The difference though between the death of the landlocked soldier and the pilot was that the former often died anonymously while the other could reap headlines and a formal funeral. The death of aces, though, could also shock an entire nation as did with the death of the famous Red Baron and French ace Georges Guynemer.